Seeking for neon colour stuff after read the June issue of ViVi. This summer is gonna splash with all the vibrant colours of accessories and apparels! Le bf went to Cotton On and buy me a pair of shoes yesterday after he saw my shoes were holes at the bottom the day before. I never felt so much love from a guy before. Thank you very much!!! 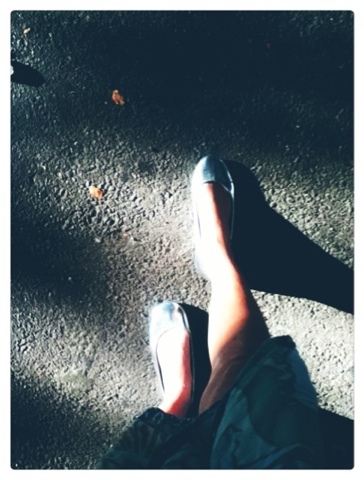 It was a pair of rubi ballet flats, in metallic silver colour. Got bored of the original gold ones, besides, metallic silver is in this season. Yay! Went to Watsons to buy a vibrant colour lip gloss, was using my neon pink nail colour as reference. Lol. Too bad there's nothing near neon pink in all the brands available there. 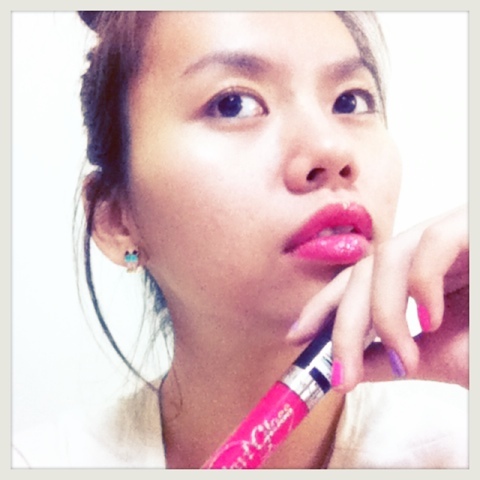 Rimmel's Vinyl Gloss Pin Up Reddish Pink is The closest I can found. Tried it rightaway as I got home. Feels less pale and looked more genki isn't. Last but not least, a short T-shirt with sailor foxes motif bought at night market. I really, really like night markets at Cheras area. There were more fashionable stuff in the night market here. Spent 4 hours at Tmn Connaught's night market that day, truly a record breaking one. Lol!